Forget grey skies, the rain and the cold. Summer in north Cyprus is to be lived outdoors. Temperatures start rising to mid to late thirties (Celcius) by mid June-July. You will quickly find that Cypriots love nature and outdoors. So why don’t you join us and enjoy the island riding your bicycle in the countryside, walk along almost empty beaches of Karpas, eat al fresco outdoors. July-August are months also enjoyed most both by sun worshipers who flock to the beaches and those who like concerts and music for during these months Famagusta Festival as well as Bellapais Music Festival are held. Personally, as much as it is super hot for some, I love July in Famagusta's pristine beaches during the day, followed by a drink at the old town's atmospheric The Monk Inn pub on William Dreghorn Street, then head out to one of city's many local restaurants for a feast! You will soon discover that us Cypriots have a love affair with our food and love sharing it with our guests, be it dinner, lunch or simple meze. If you happen to be in Kyrenia, when the bright but hot afternoon sun gently gives way to a balmy evening there’s nothing better but to enjoy the scenic view of Kyrenia under the Tree of Idleness in Bellapais village. Or if you happen to be in the capital Nicosia's wonderful old part, simply devour the medieval atmosphere in the Büyük Han (Great Inn) with a well earned cup of Turkish coffee and a local favourite “kayik pasta” (boat cakes). You will be hooked on them in no time. This month we bring you a special section of "Bir Zamanlar Kıbrıs'ta" (Once Upon a Time in Cyprus). Sadly the articles written in this section are in Turkish only, by Cypriot columnists and writers reminiscing the good old days gone by. At North Cyprus - cypnet.co.uk we aim to bring you different aspects of life and culture of the island. In doing so we are always delighted to have this opportunity to serve you and to share with you the various aspects of life in Northern Cyprus. Of course, while nothing compares to an actual first hand visit to this corner of earth which is truly a sanctuary of unspoilt beauty, we hope that the facts you find within this site will provide you with a better understanding of the people, history, archaeology, culture, politics, economic development and environmental beauties of our beautiful and unique island. Bellapais, unchanged and unhurried since its colonial days, this enchanting village has been immortalised in the book "Bitter Lemons" by Lawrence Durrell. 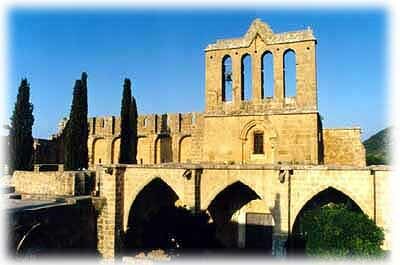 The centre piece of the charming village and its main attraction is Bellapais Abbey. Imagine a summer Sunday morning, you are walking through the beach collecting curvy seashells to add to your collection. The sun is warming your body as you witness one of the main nesting grounds of the Chelonida mydas and Caretta Caretta sea turtles in the Mediterranean. A stopover at Yeni ErenkÃ¶y for a sumptuous seafood lunch at Mehmet's Place gives you the local flavour. Make sure you taste the local grilled Halloumi cheese in pita bread with tomatoes. In the afternoon you must stop at Sipahi (Ayia Tria) village and walk through the olive groves, breath in the fresh air and talk to the villagers - both Turkish and Greek-Cypriots who invite you to their homes for Turkish coffee and tasting their walnut, orange and bergamot preserves. We have a saying on the island "Eat sweet, talk sweet". At the end of your day, you'll wonder when you can make the time to come back and explore the rest of Karpas landscape.